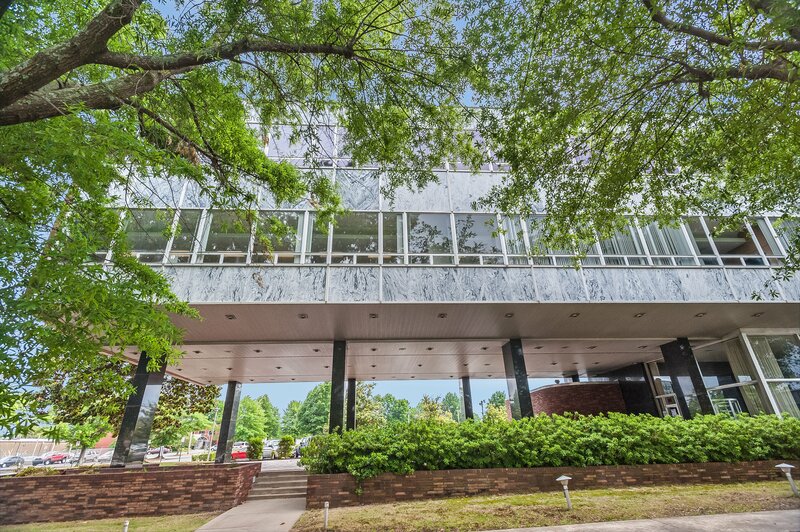 The Historic Preservation Alliance of Arkansas recently honored Entergy for its preservation of the Arkansas Power and Light building in Little Rock. This "International Style" office building was built some 52 years ago using marble slab cladding. When it was built the building was heralded for its sleek lines and modern appearance. Over time, the solid marble cladding from the 50's had begun to deteriorate and bow. What the original architect had not considered was tendency of slab marble to bow. The problem with the 1½" thick solid marble cladding slabs is the calcite that they are made of. When the marble warms in the sun, the calcite crystals expand and contract at different rates along different internal axis. Over time, the combination of bowing and weathering weakened the marble cladding panels. With the panels posing a real hazard, Entergy contacted Cromwell Architects and Engineers. Because of the weight of thick stone slabs there was concern with how the older building could support them. Then they found StonePly. The StonePly panels gave Entergy the ability to keep the original stone finish and style, while simplifying replacement and reducing the weight on the historic structure. With StonePly the rigid aluminum honeycomb composite keeps the stone panels straight and stable.